Melly and Tom McCarron are used to moving; their father, Jim, is a veteran of World War II. But once the family is finally back together and settled in North Carolina, yet another conflict erupts--the Cold War. 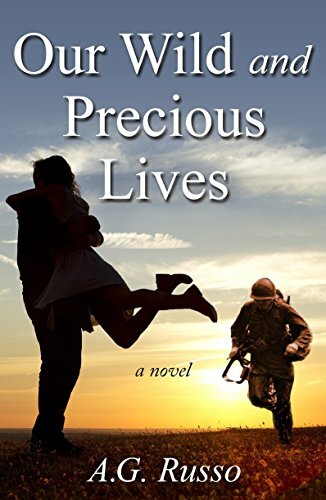 When Jim takes a new position in Germany, Melly and Tom are uprooted and moved to an American base, an unknown place to them where they barely know the language. They are being torn away from their Aunt Deeny, who acts as a role model and friend of theirs. However, they don’t complain due to the fear of their father’s abusiveness. Tom and Melly are scared but know at least they will have each other. The two become as close as ever as they help each other survive their new life in Germany. They meet other Army Brats, make friends, and experience the normal drama of high school. I really enjoyed reading Our Wild and Precious Lives by A.G. Russo. The plot moved at a nice pace, and I never found myself becoming disinterested. Russo’s characters are complex and show development throughout the novel. Melly is a strong female character, while Tom is very likeable. Melly and Tom’s relationship is admirable, and it was nice to read about a brother and sister who loved each other so dearly. This novel dealt with serious subjects, such as mental illness, war, and abuse. It didn’t romanticize these subjects. Instead, it dealt with them in a realistic way, not sugar coating anything. While it did include these heavy topics, it was a story of love as well--not only romantic love, but also familial love. I enjoyed how this was a historical novel, but the way the facts were presented wasn’t overbearing. It is clear the author did great research into the Cold War and understood how war affects families. This novel was the perfect mix of adventure, love, and heartbreak. I would recommend it to anyone looking for a historical drama. This novel contained explicit language, intimate scenes, and dealt with subjects that may be sensitive to some readers, such as abuse.